Scmdraft updated to 0.9.07 - New Ramps ! The ScmDraft 2 download has been updated to 0.9.07. This adds support for StarCraft: Remastered specific ramp doodads and the corresponding map format. 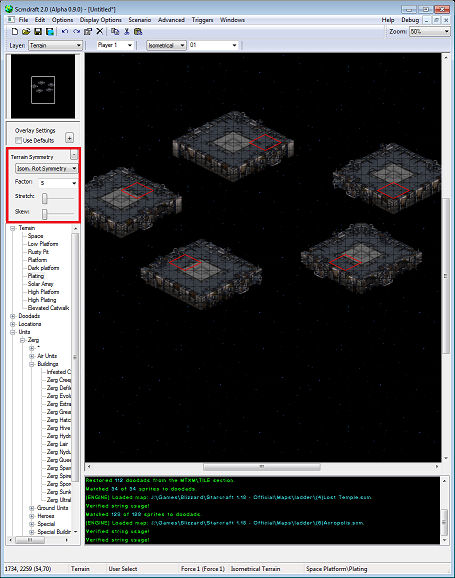 The doodad palette was also updates to display the current active custom tile overlays, if custom overlays are enabled. 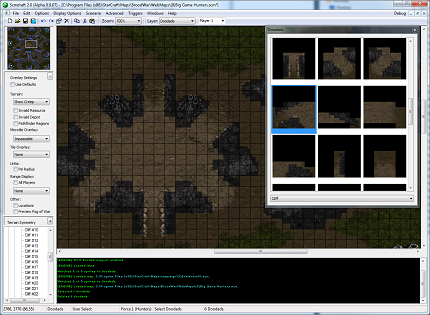 A map with the new ramps, and the doodad palette with overlays enabled. When launching a profile that is configured to use a 1.22 or newer install, ScmDraft should automatically detect the presence of the new datafiles and offer to modify the active profile. Otherwise the patch_ed.mpq file must be manually added as a fourth data MPQ. This version is available both as an installer and as a ZIP file. Pre-release builds will be made available here. The next major feature will be a unicode build, to improve support for localized map strings. I would like to thank everybody who took the time to report bugs. Please continue reporting bugs. The ScmDraft 2 download has been updated to 0.9.0506. 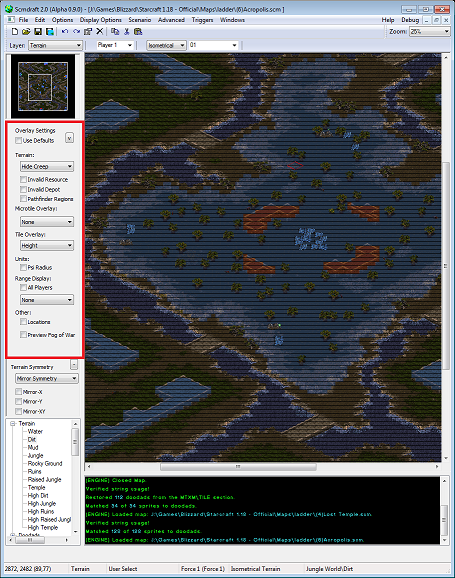 This release adds the ability to offset the map contents. 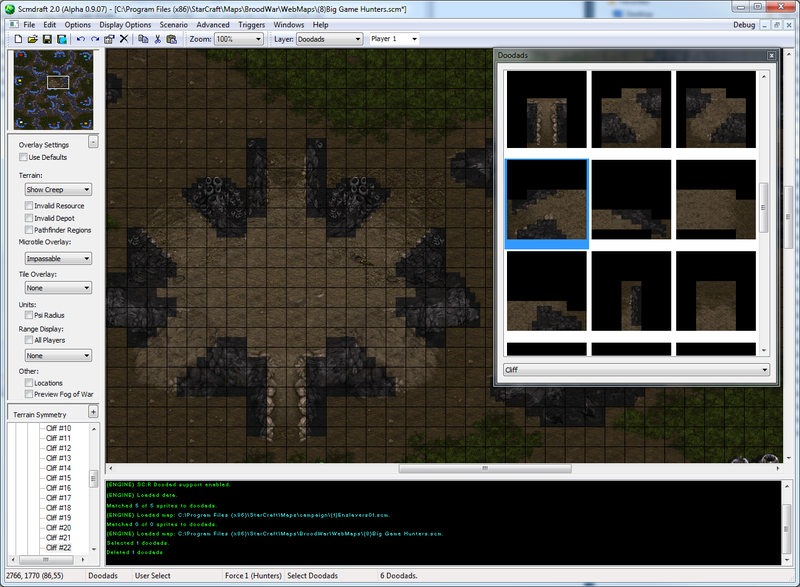 This also adds undo and redo support for resizing, offsetting, and tileset morphing. Lastly, a few reported bugs were fixed and a potential crash issue was identified and eliminated. Please continue reporting bugs and requesting new features to be added. As always, pre-release builds will be made available here. Note: A hotfix version 0.9.06 was uploaded to address a bug in 0.9.05. The ScmDraft 2 download has been updated to 0.9.04. This address a reported potential crash when placing terrain in the bottom right of the map. Please continue reporting bugs and requesting features. The ScmDraft 2 download has been updated to 0.9.03. This update includes an overhaul of the classic trigger editor, with parameter caching and newly added support for EUD conditions and actions. EUD support in the text trigger editor has also been improved. It also includes internal overhaul of the animation subsystem, which removes the limitation of 8 map viewports per map and fixes a few minor graphical glitches when placing door sprites. 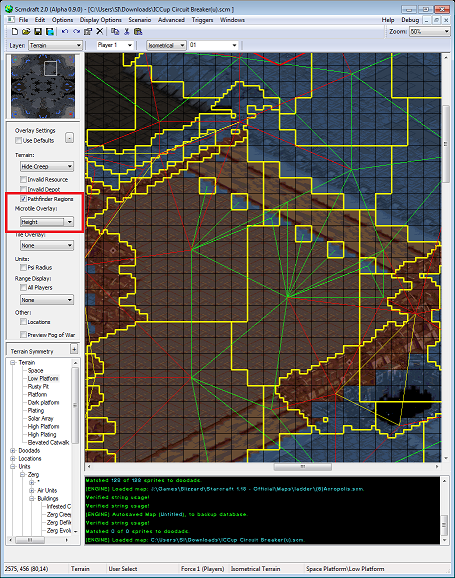 This also fixes a few minor bugs, adds briefing color code preview, and improves terrain placement performance when placing huge amounts of terrain at once. As always, the newest builds are available here. The ScmDraft 2 download has been updated to 0.9.02. This update fixes a handful of reported bugs, and adds a graphical building damage preview as well as a few other minor changes. This version is available both as an installer and as a ZIP file. Currently my day job is keeping me quite busy, I hope to have time to add additional larger features starting in mid November. Please continue reporting bugs and requesting features. The ScmDraft 2 download has been updated to 0.9.01. This update fixes two reported bugs, and modifies the auto-update and backup database mechanisms to work when ScmDraft is run from directories where it does not have write permission. This version is available both as an installer and as a ZIP file. As always, the newest (roughly weekly) builds are available here. Poiuy_qwert has provided a step by step guide on how to run ScmDraft on a mac, view it here. I am releasing the next ScmDraft 2 build, version 0.9.0. This version is available both as an installer and as a ZIP file. Additionally, the newest (roughly weekly) builds are available here. New unit, unit sprite, pure sprite palette windows. 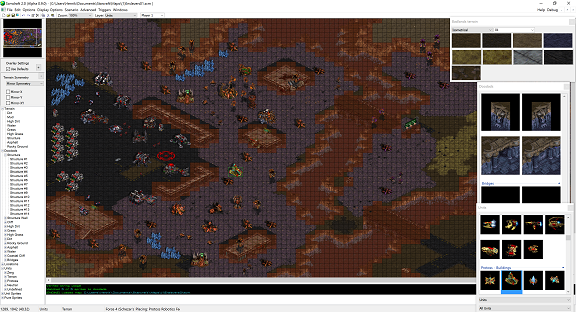 Completely redone map properties window, including string filtering. Overhaul of the entire UI to support HiDPI / font scaling, nicer looking controls, better resizing, etc. 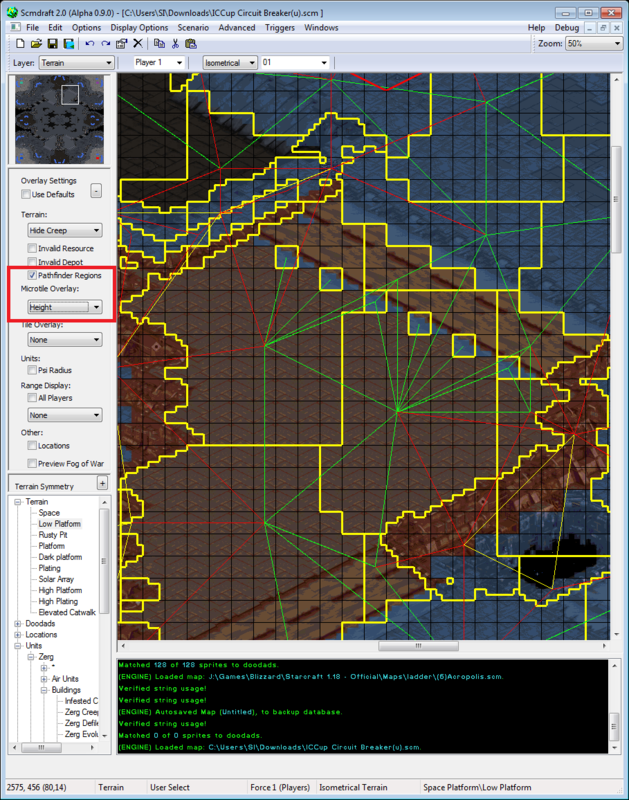 Expanded terrain symmetry options, to support rotational symmetry with various parameters. Added support for the vorbis OGG sound file format in triggers. Enhanced logging, available via -console command line or in the debug menu. ScmDraft 2 with various palettes open, on a 4K display. To forestall the most common question, does it support SC:R graphics? - Not at the moment. I would like to add support for those at some point, but adding a second graphics engine is a large undertaking, and this is a project I work on in my free time as my full time job allows. However all of the changes I have done in the past 9 months have been designed to eventually support the new graphics. 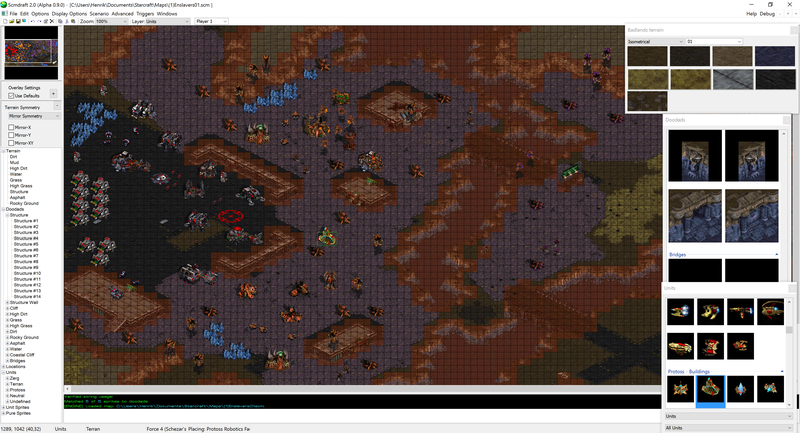 Pathfinding region preview, and terrain height display. Windows: This should work under windows XP, however I have not personally tried it on anything older than Windows 7. Mac: Poiuy_qwert has provided a step by step guide on how to run ScmDraft on a mac, view it here. Linux: Similar to Mac, WINE is required. ScmDraft will run, but some of the windows may occasionally glitch. If something does not work as expected, let me know so I can fix it. Worse, if it crashes for any reason, save the generated minidump and pass it along so it can be fixed in the next version. I cannot fix bugs unless they are reported. Please note: Due to the enhanced security model present in windows vista and newer, the auto-update mechanism may not be able to download and update automatically. It is now possible to preview the pseudo weekly builds of a new Scmdraft 2 version. These builds contains the changes I have spent the last 9 months or so working on, related to both improving the feature-set, stability, and the performance of Scmdraft 2. Most of the work involved rewriting a substantial amount of the codebase which had grown over 8 years, fixing buffer overflows, adding better error handling, in order to streamline adding fancy new features. Note: This is still a work in progress and may contain newly introduced bugs. Please report anything that does not work as it should. Some of the new features include reworked and newly added palette windows, substantially extended overlay options, improvements to the fog of war and creep previews, etc. The full list of downloads and a more complete list of changes may be found here. Although I had hoped to make a final official release before Starcraft II came out, it will not happen before the start of the beta, which is today. However, for those interested in the latest scmdraft II build, it is available here. This link is updated roughly every week with the newest build. Minor warning, it may introduce new bugs.